I laugh every time I hear this suggestion, and I laugh a lot! Of course this is not true. In fact, it�s counterproductive to learning the proper way to draw the cue ball. Pulling the cue ball on impact only limits the amount of speed you can transfer from your cue to the cue ball. On top of that, stopping your cue like that would force you to squeeze the cue to pull it back. That opens up an entirely different set of problems. Sometimes bad information makes it through the instructional channels, and that�s one of those instances. I have even had a player tell me that he was warned that following through on a draw shot would result in ripping the cloth, so he never followed through. We started working on letting the cue travel through the cue ball and after 45 minutes, he was drawing the cue ball better than he had his entire life. Sometimes you just have to let go of bad habits. 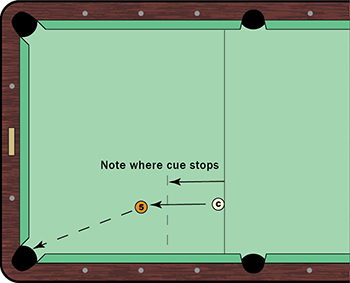 Here is an exercise that will help you understand and become comfortable with the proper way to draw the cue ball. The distance between the cue ball and the object ball should be about a foot. Also, make sure the shot is at a slight angle, so that you can stroke through the ball without worrying that it will come right back at you. Finally, mark the locations of the balls with a piece of chalk so that you can set the shot up exactly the same way over and over. After every shot, check to see where the tip of your cue came to rest. This is the distance of your follow through. There is no magic distance you should aim for. The harder the shot, the longer the follow through. The softer the shot, the shorter the follow through.